BERKELEY, Calif. — University of California, Berkeley, Chancellor Carol Christ signed a memorandum of understanding last week committing the Berkeley campus to 100 percent clean, renewable energy by 2050. The University of California system already made a pledge to purchase only clean electricity by 2025, but this commitment goes further, covering uses like energy production, transportation, and heating, which currently comes primarily from natural gas. The wide-ranging nature of this commitment positions UC Berkeley as a public university leader on sustainability. Other institutions like Cornell University and Brown University have also made clean energy commitments, but no other public university UC Berkeley’s size has made a similar obligation. 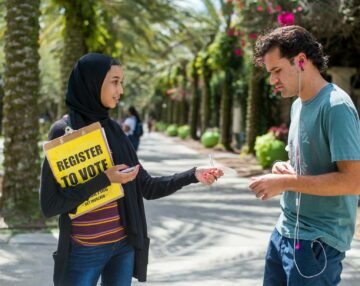 The victory is reflective of the work Student PIRGs and coalition partners, including Environment America, are doing nationwide with students on more than 50 campuses in 15 states. CALPIRG Students spent two years working on securing this clean energy commitment from UC Berkeley officials. Efforts included collecting more than 3,000 petition signatures for clean energy, securing the support of 45 student group and faculty sign-ons, and passing an ASUC Student Government resolution on the issue. 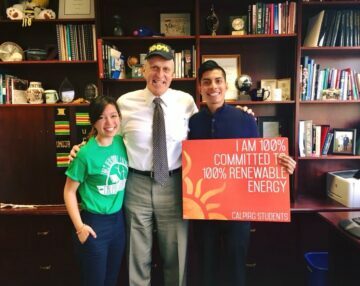 CALPIRG’s Campaign for 100% Clean Energy at UC Berkeley follows its successful organizing efforts to pass SB100, a landmark piece of legislation in which the state committed to 100 percent clean electricity by 2045. CALPIRG Students brought hundreds of students to the capitol to lobby on this bill, and collected 20,000 petitions for the commitment as well. 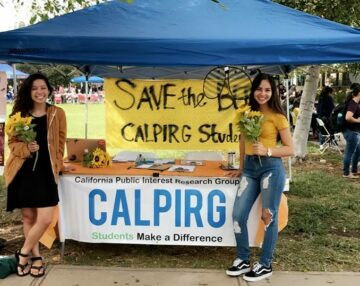 CALPIRG Students is a statewide student-directed and student-funded organization at eight UC campuses working towards a greener, healthier, and more meaningful future.